Idaho Duelist Zachary Carkin is using Paleozoics today, packed with Performapal Five-Rainbow Magician to shut down his expected Pendulum Magician opponents. This round, however, he’ll be Dueling against True Dracos, piloted by Elmehdi Mejdoub. Mejdoub is one of several Italian Duelists who made the trip here from Italy! We just featured his friend Alessio Giordani in a Round 2 Feature Match, and now it’s his turn for a Feature Match. It’s time to Duel! Mejdoub won the die roll and chose to play first. He started off with Pot of Desires, then Pot of Duality. He revealed Terraforming, Solemn Judgment, and Ignis Heat, the True Dracowarrior. He took Terraforming and activated it, getting Dragonic Diagram. He Set True Draco Apocalypse, and destroyed it with Diagram to put Majesty Maiden, the True Dracocaster in his hand. He activated Heritage, Set three to his back row, then used Heritage to Tribute Summon Majesty Maiden, using Apocalypse for the Tribute. He flipped up Card of Demise, then used Heritage to draw another card. He Tributed Heritage and Majesty Maiden for Master Peace, the True Dracoslaying King! He Set a third and fourth card in his back row to finish his turn. Carkin had Swap Frog, Solemn Judgment, Mistake, Imperial Order, Paleozoic Canadia, and Ronintoadin. Mejdoub flipped up Anti-Spell Fragrance in the Draw Phase. Carkin Normal Summoned Swap Frog, sending another Swap Frog to the Graveyard. Master Peace banished Apocalypse to destroy Swap. Carkin Set all of his Trap Cards. Mejdoub played Pot of Duality, and Carkin responded with Imperial Order. Mejdoub played Amano-Iwato. It attacked directly. Carkin responded with Canadia to turn Master Peace face-down, and Mejdoub used Master Peace in response, destroying Imperial Order. In Main Phase 2, he used Dragonic Diagram, but Carkin flipped Mistake, then Special Summoned Canadia from the Graveyard. Amano-Iwato returned to Mejdoub’s hand. Carkin drew Pot of Desires. He Normal Summoned Ronintoadin, stacking it with Canadia for Sky Cavalry Centaurea. It attacked Master Peace, losing the battle, but bouncing Master Peace back to the hand. (Master Peace was no longer immune to monster effects since it had been turned face-down.) In Main Phase 2, he Set Pot of Desires. Mejdoub Normal Summoned Amano-Iwato, then flipped up Disciples of the True Dracophoenix. He used its effect, Tributing Anti-Spell Fragrance and Amano-Iwato to play Master Peace again, but Carkin flipped Solemn Judgment! Carkin drew Paleozoic Olenoides. He flipped up Pot of Desires, and Mejdoub flipped Imperial Order! He attacked with Centaurea, and Set Olenoides. Mejdoub lost 700 Life Points in the Standby Phase thanks to Imperial Order. He Set one to his back row. Carkin drew Monster Reborn, and Mejdoub lost another 700 Life Points. Carkin attacked with Centaurea. Mejdoub lost yet another 700 Life Points. He Tributed Imperial Order for Majesty Maiden, then used Disciples to return True Draco Apocalypse, Majesty Maiden, and Master Peace from his Graveyard to the Deck, and drew a card. He Set a card in his back row. Carkin drew Dupe Frog. He played Monster Reborn to revive Swap Frog, using its effect to put another Swap Frog in the Graveyard. He banished that to bring back Ronintoadin, then Normal Summoned Dupe Frog. He used all of his monsters to play Saryuja Skull Dread, drawing two copies of Anti-Spell Fragrance, Heavy Storm Duster, and Paleozoic Canadia. He kept Heavy Storm Duster in his hand. He banished Swap to bring Ronintoadin back again, then flipped Paleozoic Olenoides to destroy a card and Special Summon Canadia. He Xyz Summoned Toadally Awesome, sending his monsters to take the first Duel! Mejdoub started first. He played Inspector Boarder, then used Terraforming to get Dragonic Diagram. Pot of Duality came next, revealing Majesty Maiden, Pot of Desires, and Card of Demise. He took Demise. He Set two back row cards and a Field Spell, then played Card of Demise to draw three, followed by Pot of Desires to draw two. He flipped up Diagram, then Set a back row card. He used Diagram to destroy Disciples from his hand, adding Heritage to his hand. He played it, then used it to Tribute Inspector Boarder and True Draco Apocalypse for Master Peace, the True Dracoslaying King. He used Heritage to draw two cards. He Set to his back row, filling it completely. In the End Phase, he had to discard Zaphion, the Timelord due to Card of Demise. Carkin had Monster Reborn, Pot of Desires, Paleozoic Canadia, Paleozoic Dinomischus, Performapal Five-Rainbow Magician, and Called by the Grave. He activated Pot of Desires, but lost it to Mejdoub’s Solemn Judgment. He Set Canadia and Dinomischus. In the End Phase, Master Peace destroyed Canadia. Mejdoub used Pot of Duality, revealing Disciples, Heritage, and Inspector Boarder. He took Heritage. He actiated Diagram, but Carkin flipped Dinomischus. He discarded Five-Rainbow Magician to banish Diagram, and he Special Summoned Canadia. Mejdoub Set his remaining cards in his back row, filling it again, and destroyed Canadia in battle. Carkin drew Ronintoadin. He Set it. Mejdoub played Dragonic Diagram. It destroyed a Set Heritage to get Ignis Heat, the True Dracowarrior into his hand. He used his on-field Heritage to draw a card, then Tributed Heritage for Ignis Heat. Master Peace destroyed the Set Ronintoadin with its effect. Mejdoub sent his True Dracos to attack directly. Carkin drew Paleozoic Dinomischus, and knew it was all over! Carkin chose to play first in the final Duel. He had Paleozoic Canadia, Called by the Grave, Foolish Burial, Ronintoadin, and Dupe Frog. He started with Foolish Burial, sending Performapal Five-Rainbow Magician to the Graveyard. He Set Canadia, and brought Five-Rainbow Magician to the field in his Pendulum Zone. He Set Dupe Frog and Called by the Grave to finish his turn. Mejdoub played Pot of Duality, revealing Skill Drain, Master Peace, and Zaphion, the Timelord. He took Zaphion. He Set three back row cards and Normal Summoned Zaphion. It attacked, and Carkin flipped Paleozoic Canadia to turn it face-down. 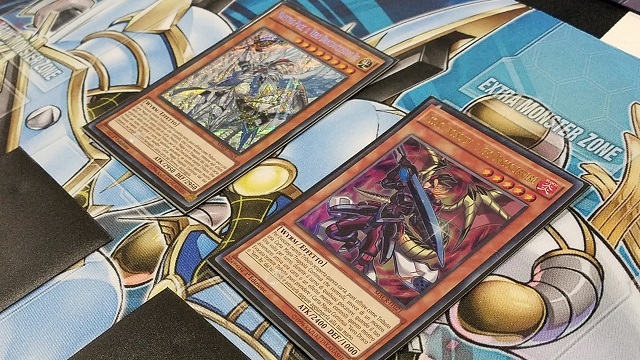 Mejdoub played Dragonic Diagram, destroying his Set True Draco Apocalypse to get True Draco Heritage to his hand, and Apocalypse destroyed Dupe Frog. Carkin added Swap Frog to his hand. Mejdoub played Heritage and drew a card. He played another Diagram, which destroyed Heritage to add Master Peace to his hand. Heritage’s effect destroyed Carkin’s Called by the Grave. Mejdoub Set one more card in his back row. Carkin drew Dupe Frog and Set it. Mejdoub flipped up True Draco Apocalypse, using it to Tribute Summon Master Peace. He Tributed Zaphion and Skill Drain. Mejdoub played Pot of Duality, taking Solemn Judgment over Majesty Maiden or Card of Demise. He Set Disciples of the True Dracophoenix, and had Diagram destroy it to search out Heritage. Disciples destroyed Five-Rainbow Magician. Master Peace destroyed Dupe Frog with its effect, and Carkin added Swap Frog to his hand. Master Peace attacked directly. He Set three back row cards to finish his turn. 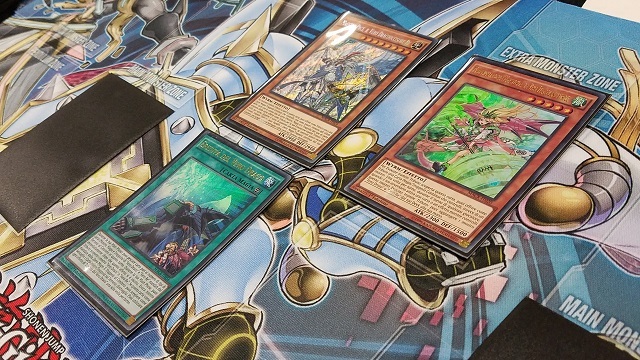 Carkin drew Torrential Tribute, and Mejdoub flipped Macro Cosmos! Carkin discarded a Swap Frog to Special Summon the other Swap in Defense Position. He Set Ronintoadin and Torrential Tribute. In the End Phase, Master Peace destroyed Torrential Tribute. Master Peace’s effect wiped out Ronintoadin. Diagram destroyed Macro Cosmos to get Majesty Maiden, and he Tribute Summoned it. Carkin had nothing but his Swap Frog – it was all over moments later! Elmehdi Mejdoub takes the Match with True Draco! QQ: Which Card From The Anime Do You Want To See Printed? 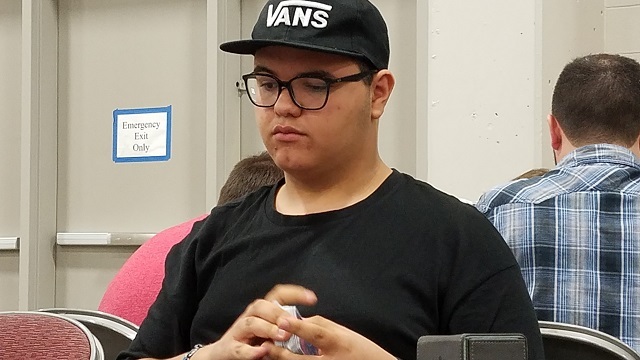 YCS Salt Lake City: Round 7 Pairings!